I've been busy the last few weekends working on this quilt for my daughters twin bed. Now that its done I'm at a loss for the quilting. I used elmers for the sandwich and feel pretty happy with the results. I have a walking foot and started doing Sid but my stitches were uneven so I pulled a whole line. Also any thoughts on thread color? I was using a variegated green but I felt like it showed up so much. Especially when I accidentally fell off the ditch or was near the dark brown. Beautiful quilt. I would just do swirls with a beige thread. I would choose a varigated green for the thread. SID is pretty sparse for the size of some of the blocks. You could do stippling or just an X in the bigger blocks. Thanks. The larger blocks are 8.5x8.5 inches. There is a website that shows different ways of quilting with a walking foot that is much more than just SID. Thought I bookmarked the web address, but of course, I can't find it now. I saw it in a thread here. The lady was doing different stitches each day. I want to say Leah Day was the person, but I don't think it was her. Does anyone remember the site? I agree the quilting should be a little closer. I will try to post the link but if it doesn't work the original was posted by tate_elliot and it was from 31 Days of Walking Foot Quilting. I tried SITD and wasn't good at it at all. So I changed to SOutsideTD, and called it art. Seriously, it takes practice to master it. The quilt top is beautiful; love the fabrics and the colors. How about using invisible thread if you don't want the wayward stitches to show? I've never used it myself so can't tell you anything about using it. If your machine has a curvy stitch - you know like an elongated "S" on it's side - that could work for you. I don't know if you can use the walking foot for that, though. Good luck. No matter what you do, your daughter will cherish the quilt! I can not help you with the quilting because I am new myself....but I wanted to say.. Very good job on your quilt top!! When I am having trouble sewing a straight line (Arthur visiting) I use a serpentine (wavy) stitch.. Looks ok then as you are not staying in the ditch. For the larger squares I agree, a X will do fine. You can do the wavy stitch on the diagonal if you choose. Looks good on the back too. "How about using invisible thread if you don't want the wayward stitches to show? I've never used it myself so can't tell you anything about using it." Because my quilting instructor touted the qualities of invisible thread, I used it on my first quilt top. After several washings and dryings, the heat has melted the thread in many places so that - sometime - I need to re-quilt it. I did SID. Most irritating to say the least. The instructor never mentioned it was unsuitable for a quilt that would be washed/dried often! STD is the hardest way for me to quilt. If I were a true beginner (not that I'm much past that), I'd cross hatch the whole quilt. Make the lines however far apart is good for your batting. Unroll several colors of thread on the quilt to see what you like. Clear can work. I've not had melting issues as mentioned above. Maybe there are different types of clear thread? I would do an echo stitch on both sides of each seam. Never outsmart your common sense. Beautiful quilt! If you are comfortable with loop-d-loops I think they would look great but I also like the idea of echoing the seams. That would really make the squares pop. As a newbie to machine quilting I found wavy lines on the diagonal of the quilt to be the easiest method. This is such a pretty quilt, love the colors! I echo the person who said brown or beige thread. I think it will blend in best and add texture to your beautiful top rather than draw attention away from it. I don't know if you free motion or not, but if you do swirls would look lovely on this. I agree that a plain crosshatch pattern will work fine - personally, I would do them about 2 inches apart. 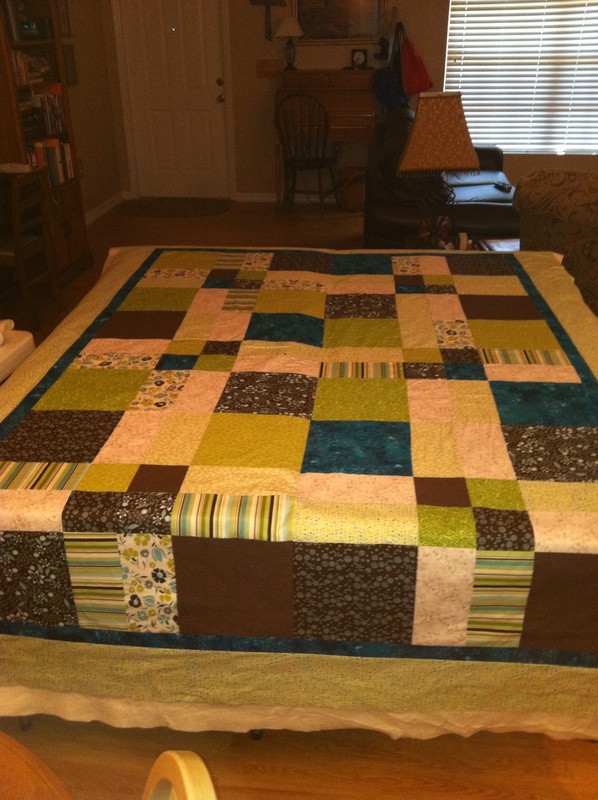 Have done that several times on similar style quilts and really liked the way they came out. Stitch in the ditch is not easy to do well. I would do an all over FMQ meander or large stipple. Or a Rose meander. I love variegated thread. I also vote for loops. I am relatively new at machine quilting as well and for some reason have been better at loops/swirls than crosshatch and lines because I'm such a stickler for perfection on the lines. With loops and swirls, they are better if they are not perfect. Do you mind sharing what fabric collection you used or did you just choose a variety of different fabrics and coordinate them yourself? Beautiful! I don't like quilt in the ditch as I am unable to stay in the ditch. I have found that by doing a gentle curve from corner to corner all around a block makes a good look and I do it with the walking foot. I had to look up what cross hatching was (HAHA) but this in another runner up. How far apart does you batting bag say the maxim quilting distance could be/should be?????? Some batting require stitching close together - others can go a larger distance. I think I would do either allover diagonal lines or cross hatches, with a decorative stitch on my machine. Anything with an open swirly or wavy pattern to it (lengthen the stitch length of the pattern) would contrast nicely with the geometry of the piecing, and add a lot of interest. I would measure and carefully place pieces of blue painter's tape onto the top, and decorative stitch alongside the edge of the tape to stay straight. Pieces of tape can be repositioned and reused several times. Just be careful not to stitch into the tape. Very pretty quilt, by the way!